How do you share the Gospel with a child who speaks a language you’ve never heard of? How do you comfort an orphan who lost a parent to AIDS or some other dreadful event? Give them something to hug and love that speaks to them in their own heart language from God’s Word… Give them a Wildlife STORYTELLERS animal. Wildlife STORYTELLERS — different soft, furry critters — share audio Bible stories with children and adults around the world in their own native tongue. The stuffed tigers, elephants, bears and others can be loaded with recordings in over 5,000 languages and dialects. When you place these animals in the hands of children and adults, it is a tactile reminder of God’s love. Research shows that stuffed animals with audio Bible inside can bring physical and emotional comfort to children and adults who have experienced trauma and pain. The Wildlife STORYTELLERS will help children of poverty, disease and disaster around the world literally feel God’s love, even as they hear about the hope He gives. And they can give any child the foundation of faith they need to grow into followers of Christ. ORAL – Two-thirds of the people in the world are oral communicators. Wildlife STORYTELLERS come with a portable audio player device with a choice of either solar-rechargable ability built into the player or a re-charge ability like a cell phone via a usb cord. Players are pre-loaded with secured Bible stories, teachings, and audio content. RELEVANT – People open their hearts and minds when they hear God’s word in their own specific native tongue, or heart languages. Wildlife STORYTELLERS can be fitted with Biblical audio content available in over 5,000 languages and dialects. SIMPLE & PRACTICAL – A special pocket in each animal can hold the portable, audio player device, which features an easy-to-use control button. The player is solar rechargeable and can be recharged hundreds of times. COMPREHENSIVE – The Wildlife STORYTELLERS can be loaded with Bible stories spanning the Old and New Testaments, meant to give a child a long lasting foundation of faith. CHILD-FOCUSED – These soft, lovable critters comfort children and share God’s Words of hope and love in a language they understand. 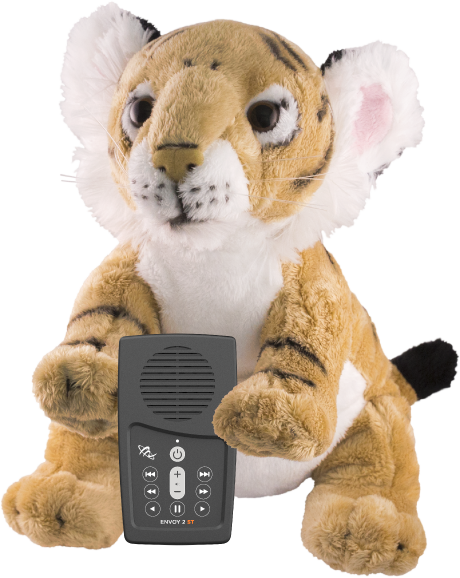 SAFE – Each Wildlife STORYTELLERS animal is child certified, as well as the audio player device.